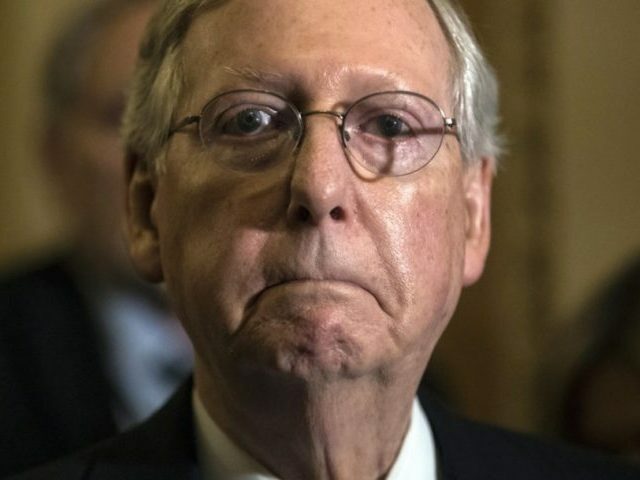 The approval rating of Senate Majority Leader Mitch McConnell (R-KY) has plummeted to just 18 percent, a survey from Public Policy Polling has found. The poll, which surveyed 645 Kentucky voters, found that just 18 percent of respondents approved of McConnell’s current performance, compared to 74 percent who disapproved. Seven percent of people said they were not sure. McConnell, who is the longest-serving U.S. Senator in Kentucky history, having represented the state since 1984, was recently criticized by President Trump for failing to pass the healthcare reform bill through the Senate. Trump’s criticism followed comments from McConnell that Trump’s political inexperience meant he had “excessive expectations” for the length of the legislative process. When asked if there were an election for the U.S. Senate today, whether they would vote for McConnell or his Democratic opponent, just 37 percent of respondents said they would support McConnell, compared to 44 percent who said they would vote Democrat. He is next up for re-election in 2020. Meanwhile, Sen. Rand Paul (R-KY) has a far higher approval rating of 39 percent, although he still holds a high disapproval rating of 47 percent. Voters in Kentucky also have a far higher opinion of Trump’s job in office, giving him a 60 percent approval rating. In last year’s presidential election, Trump carried the state by 62.5 against Hillary Clinton’s 32.7 percent.